This power tool is the latest advancement in equine dentistry. It provides the trained veterinarian with a portable instrument for dental equilibration in the horse. Available with irrigation and suction this is the new standard in battery operated dental power tools. The long disc head tool rotates to accommodate upper or lower arcades. Head can be angled for precise placement. 2. Batteries & Charger - Lithium powered batteries, long lasting and effective - last for approximately 10 cases - kit includes 2 batteries and charger so you never run out of power. 3. Vacuum - Removes dust, particles and irrigation water whilst performing dental procedures. Supplied with 2 batteries and charger. 4. Irrigation - provides water to prevent thermal trauma during grinding. 6. Carry Case - Protective carry case to easily transport the Flexifloat Ultra. MAINTENANCE - Is minimal on this tool. After each use simply immerse the head in to a bucket of water and run with the vacuum on and clean the disc with the small brush provided. Then use the irrigation nozzle cleaner tool to gently pick out any debris from that area. DO NOT leave the unit in a bucket of water with the vacuum running as this will eventually fill up your vacuum with water. 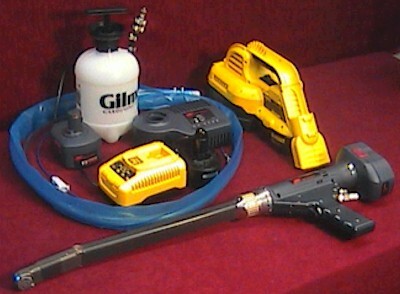 A grease gun is included with the kit. There are three grease fittings on the Ultra that require grease approximately every 100 horses or when the unit becomes noisier during operation. DIASTEMA BURRS - We have three different diastema burrs available for the Flexifloat Ultra. Fine tipped cone, rounded tip cone, cylindrical burr.